Think of this as a springtime warmup to the full-on Caprese salad ahead. In a few months, we’ll be slicing thick slabs of heirloom tomato to layer with buffalo mozzarella, juice pooling across the plate, a true summer salad. This is that salad’s young green cousin, made before the arugula bolts, sweet with quick-ripening cherry tomatoes and enriched by a handful of creamy bambini bocconcini. If you have a bottle of good syrupy balsamic vinegar, I recommend using it here. Need a salad to bring to a party? This one travels well (undressed, of course) and rates favorably on the seems-fancy-but-is-a-snap-to-prepare scale. 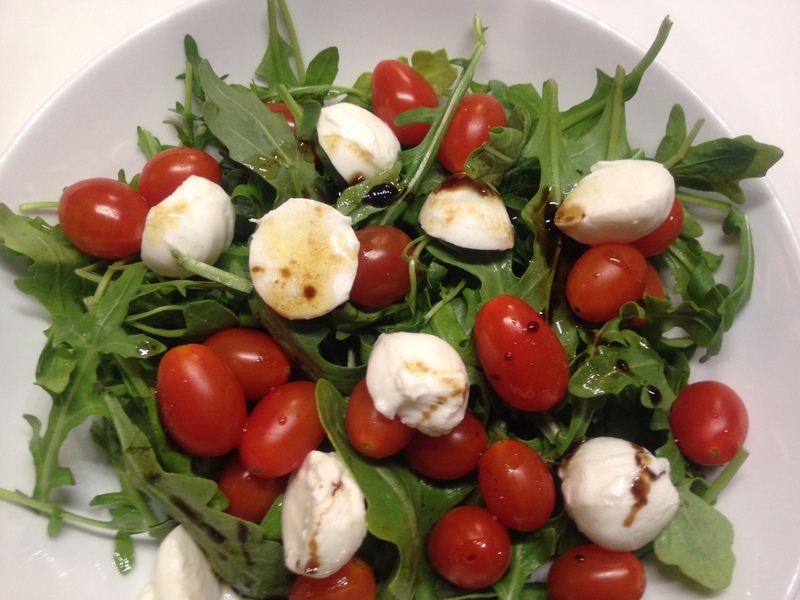 Arugula Salad with Tomatoes and Mozzarella: Top a bowl of arugula with a big handful of cherry tomatoes and a smaller handful of diced fresh mozzarella. (If you can find the little bocconcini balls, they’re cute here but of course not necessary. I like to cut mine in half so I get cheese in more bites.) Sprinkle with a pinch of salt and drizzle lightly with olive oil and balsamic vinegar. This entry was posted in Food, Recipes, Salads and tagged cheese, cooking, dinner, family, food, lifestyle, recipes, salad, vegetarian on May 24, 2012 by emmycooks. I think I made that exact salad a trillion times pre-vegan life. It’ amazing how something so simple can be SO good! I have a question and can’t find the answer… maybe you — or one of your readers — can help me. What can I use to replace eggs in a recipe. I am allergic to gluten and make my own gluten-free bread… but the recipe ask for 3 eggs… and I can’t eat eggs. What can I use to replace the eggs and having the same or similar result in the raising of my bread? EnerG Egg replacer, you can find it in a health food store. It’s a great gluten free egg replacer. You could also try 1 tablespoon ground flax mixed with 3 tablespoons water for each egg you are replacing. This won’t give as much rise to your baked goods, but acts as an amazing binder and works well in muffins, quick breads and whole grain breads. One of my favorites. Looks great, Emmy!